I decided to put up a blog for WFRP3. Nothing fancy. Just easily browsed "starters kit" with "what to watch and what to read", most important links and naturally a download section. For this I would need links to the files that you would like to be uploaded and little C&C. I'm doing this from work mainly so it may take some time. You can already see the WIP at HERE. At least now commenting on the site is closed as previously it just lead to a boat load of spam. Do you think that in the future you may allow contributors? 2) Not sure about that either. I suppose there could be a plugin for it. It'll try to search one. BTW, for loading up your drafts of stuff, dropbox has free uploads and downloads without the sribd/mediafire-type pains btw. I use it for my non-maptool related WFRP stuff and work stuff as well (including long-term backups). I think you get a couple gb of space and can link it to any computer directly or just access from the website. Some new post (hopefully I'll build the movie list today) and possibly working CAPTCHA for comments. and possibly working CAPTCHA for comments. I highly recommend Akismet to manage comment spam. It works pretty well for the RDP site. Updated movie list and create one for background music too. I know I've only started but is there something you would like to see? I was entertaining a thought about reviews about the gaming components but as I tend to struggle with writing long texts in English I even thought about "recruiting" someone for doing them. That being said I'm more than happy to publish things that anyone has written. Given that they're actually useful for players of WFRP. Andy Law gave permission to link his preview of upcoming (insanely) detailed map of Empire. And the preview is of Reikland! Check it out HERE. Did he say when the whole thing would be finished? Great stuff - love the flowcharts! Thank you for the map. Its lovely. Its so lovely it brings out the anally obsessive plot fits with map in me! There is something quite interesting in my last post... If your a WFRP book fanatic it should get you interested. Quite possibly drooling. Nice gig you got there Doc Cthulhu. If you want to accept fan materials I got several of them laying arround (some where uploaded on old Hammerzeit, and others are new). But if you thinking of doing so, let me know and I will upload them to you. good work and good gaming. What a wonderful resource! Thank you for taking the time to put it together and keep it up to date! I got the impression that next LF is almost full but if you would like send your material to me at doc_cthulhu (at) hotmail (dot) com and I upload them on Daily Empire. I would like to add that the sneak peak is NOT made by me. Only served with permission. I believe Emirikol (Jay Hafner) is already collecting proposals for LF IX, but it doesn't have a lead editor yet, and the theme is still TBD. well I am ready to start working on LF IX, but basically the things I got is smaller articles that previously was updated to Hammerzeit, like Expanded Equipment list, A chart of all the provinces in the Empire. along with some new things I am working on. Doc Cthulhu, I can send you all the materials that was previously sent to Hammerzeit. It's nothing too fancy, but if you want to use them, great. Later I will send the new materials I am working on. I'll try to add our gaming logs as an inspiration source and would like to encourage all logers to send me their logs (or the links to them) so I could host them too. Update - The Daily Empire is currently hosting 8 one-sheet, 13 adventure seeds and small amount of other fan material. As always all material is more than welcome. 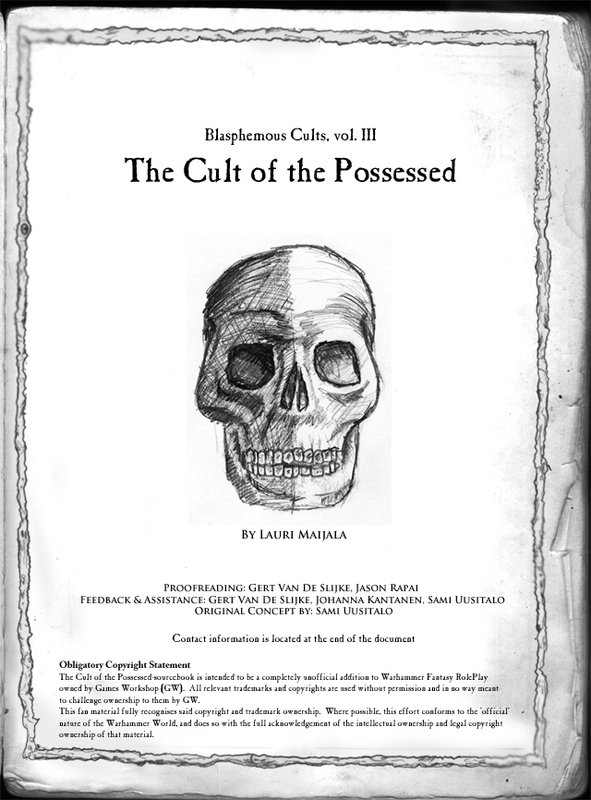 There's also a (lameish) preview of Blasphemous Cults 3 in the new post. Link in my signature. Great site by the way, Doc. I just wanted to let you know that I've released 2 more vids in my WFRP3 series on Youtube. Feel free to link those on the page as well. I've released 2 more vids in my WFRP3 series on Youtube. Feel free to link those on the page as well. Will do that. I was checking for YouTube last night but must have missed 'em. And do not forget to comment!